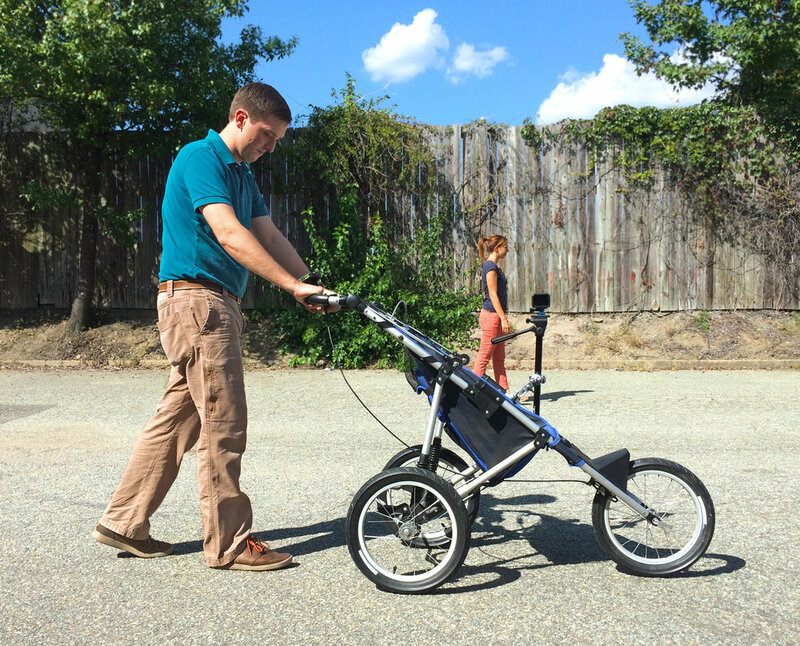 “What about a jogging stroller?” This question started us on a path to offer a whole new level of gait rehabilitation training. We had been discussing an article by Toro, Nester, & Farren (2003) about observational gait analysis and its clinical utility. The research study showed that observational gait analysis is not a very reliable measure, primarily resulting from varying skill levels among clinicians. However, it is a fundamental skill for any physical therapist who practices gait rehabilitation, and it is a quick and easy way to gather detailed information about a patient’s impairments. We wondered, how can we help make observational gait analysis easier and more reliable for the practicing clinician? When we searched YouTube for educational videos, we discovered part of the problem. Video case studies are a great way to increase observational skill for students and practitioners alike, but the quality of available content was lacking. Many of the videos we found were taken in a living room or hallway with poor lighting, making it difficult to accurately capture the individual’s true walking pattern. Most videos also suffered from “parallax error,” with the camera staying fixed to one position and thus the viewing angle changes as the patient walks past. This effect is the same as if one were to try to read a car’s speedometer from the passenger seat. This would result in an inaccurate reading of the car’s speed. The same is with gait, where the parallax error makes a true visual gait analysis nearly impossible to perform. A jogging stroller was easily found using local classified advertisements. We ensured that the stroller we selected included shocks and had wheels that were large enough to easily roll over obstacles for outdoor filming. Then we needed a camera. We invested in a GoPro Hero 5 Black camera for its wide angle lens and its image stabilization capabilities, which we needed for any outdoor filming or rough terrain. The GoPro also gave us the ability to capture a high-definition video that clearly shows fine details, even at 1/10th of its normal speed! To mount the camera, we used a monopod that allowed us to easily adjust the height of the mounted camera or flip it upside down for a different view of a model’s feet. Then we had to mount the monopod onto the stroller frame. With the musical backgrounds of some of our staff, we realized that a mounting clamp built for a drumset would be the perfect mix of adjustability, strength, and stability to allow us to adjust the camera’s angle and keep the camera securely attached to the stroller, even over gravel and rocky ground. With this combination of items, “CJ” was created. 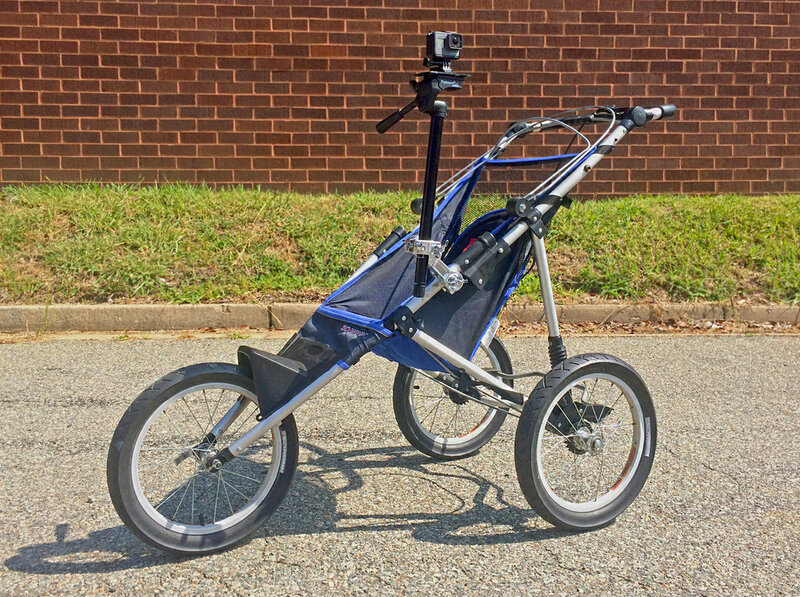 We experimented with adding various weights to the stroller to engage the shocks, and then used an iPhone-based accelerometer to measure improvements to stability. To achieve even better video quality, professional video software was used to smooth the video image. The end result: a high definition video that can be slowed down without losing image quality and clearly shows a patient’s walking pattern. While this may sound like an overly simple solution for the complex issue of clinician education, we have seen an impact from our videos. We have posted many of our videos on our YouTube channel for convenience and easy access. Our YouTube viewership comes from across the globe, with clinicians from the Philippines to Germany to Costa Rica all practicing their skills and learning new interventions. In the classroom setting, students have commented on the clarity and ease of use of our videos for gait analysis. We have noted improved efficiency in our students' ability to analyze walking patterns as a result of the case studies we provide. Finally, our models have expressed interest in learning more about their own gait patterns after seeing their videos. It has helped patients take ownership of their rehabilitation and encourages them in their progress. We are excited to be able to provide these high-quality videos, and we hope that they are of benefit to you, whether you are a student or an experienced practitioner. If you are interested in capturing your own videos for your patients or for educational purposes, we encourage you to create a “CJ” of your own as a tool for gait analysis in the clinic or in the community setting. To see our current videos from “CJ”, you can visit our YouTube channel. Adobe products are used to edit our videos. 1. Toro, B., C. Nester, and P. Farren. "A review of observational gait assessment in clinical practice." Physiotherapy Theory and Practice 19, no. 3 (2003): 137-149.